Bart Tare meets the woman of his dreams, Annie, at a carnival when they engage in a sharp-shooting competition. Bart has always loved guns, and he’s happy to find a woman who loves them as much as he does. The two quickly fall in love and marry, but Annie doesn’t want to be poor… so the two go on a crime spree, hoping to make enough dough so that they’ll never have to work again. The film was shot in about a month and a half, during May and June of 1949. It was first released on January 20, 1950. Though the film was written by Dalton Trumbo, Millard Kaufman was given credit for the screenplay because Trumbo was blacklisted. Kaufman later asked the WGA to remove his writing credit and give Trumbo official credit. Kaufman claimed that he had never even seen the film, and that he took credit as a favor to his agent, who also represented Trumbo. According to TCMDb, only the actors, film crew and people inside the bank knew that the heist scene was being filmed. It was shot in one take. Someone can be heard screaming about the bank being robbed as Annie and Bart drive away — the voice of a bystander who didn’t realize it was all for a movie! Annie and Bart are loosely based on Bonnie Parker and Clyde Barrow. 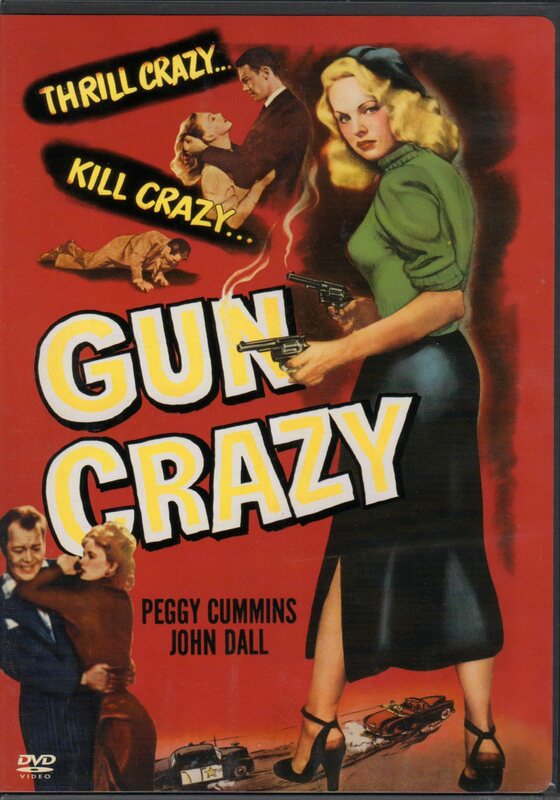 Though Gun Crazy is the original title, the film was for a short period known as Deadly is the Female. It was reviewed under this title by movie mags before the name was changed back. According to a 1949 Hollywood Reporter news blurb, Veronica Lake was originally considered for the role of Annie. 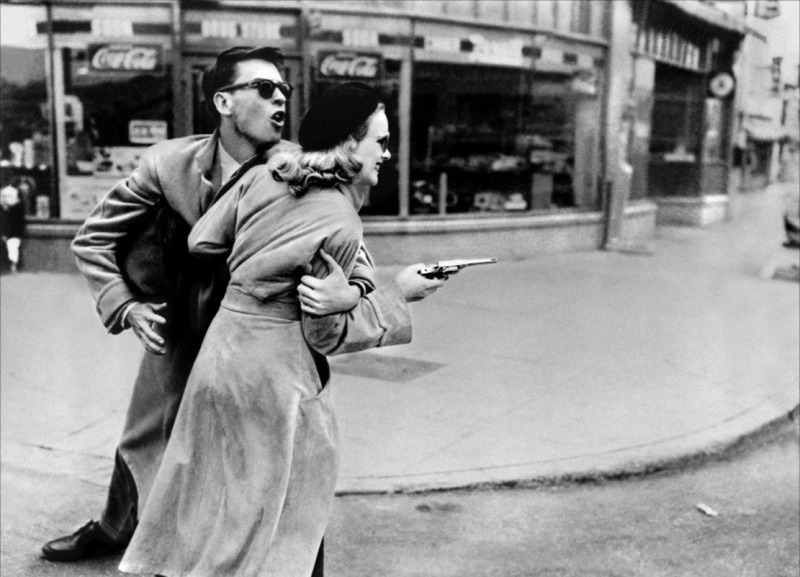 The 1992 Drew Barrymore film Guncrazy is inspired by, but not directly based on the 1950 film. Some of the film’s dialogue was improvised by Dall and Cummins. Bart gets sent to reform school, only to continue his weapon obsession. That revolver collection! Annie’s face when she looks back after the bank robbery to see if anyone is following them — she looks certifiably crazy! Their faces have been all over the newspapers, and yet all it takes for Annie to get a job is for her to put on some glasses as a disguise! Alarm that literally sounds like a wailing human being. WAAA-OOH WAAA-OOH WAAA-OOH WAAA-OOH WAAAAAH! Rollercoaster! Carousel! Popcorn and balloons! Weighing games! Dancing! What fun! Bart’s luck with cars isn’t much better than his luck was with puddles as a young chap. The super-foggy scene where Bart and Annie are hiding in the brush. So perfect, especially the final minute… what a powerful way to end a fantastic film. 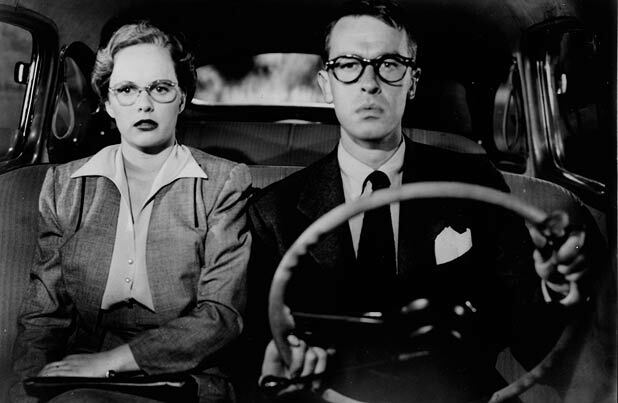 Yes, what a great, fun film noir…love that single-take shot from the back of the car as they approach the bank. And next time I watch, I’ll have to listen for that panicked woman screaming about a bank robbery!